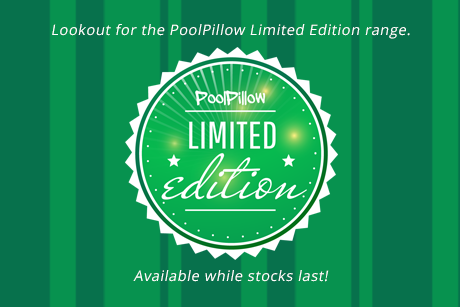 PoolPillow (Official) 100% Original Pool Pillows. Simple floating around fun. Lounging around luxury and relaxation. 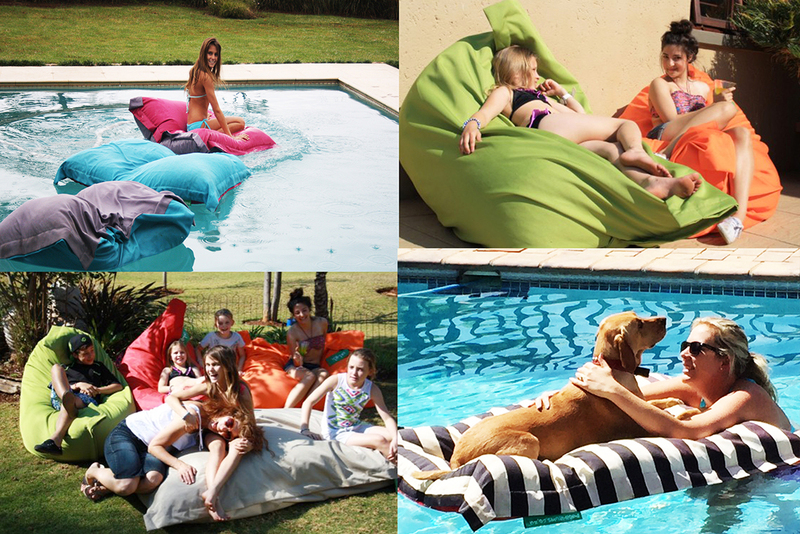 PoolPillow, the most fun, durable floating pillow for the pool, loungers for your garden or any outside area. 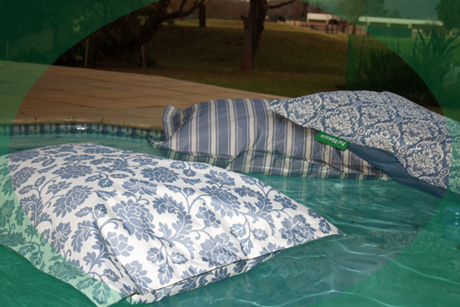 Strong and durable, our pool pillows are designed to rule the pool!! Floating on the water, putting up with rigorous play without deflating, it's pretty puncture proof and unlikely to take off in the wind. 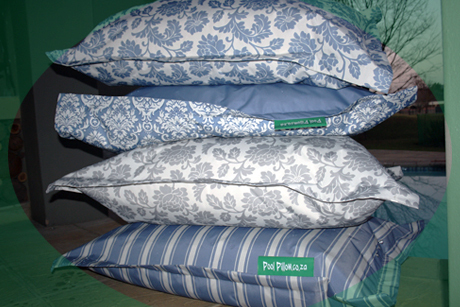 Pool Pillows are a great gift, a fun addition to your home and a luxurious extra to any hotel, lodge or spa. 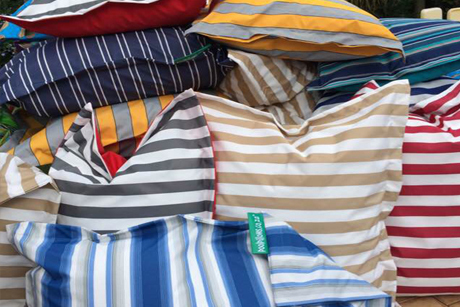 Pool Pillows are not just a luxury, but a necessity to any pool or garden, and at affordable prices too. 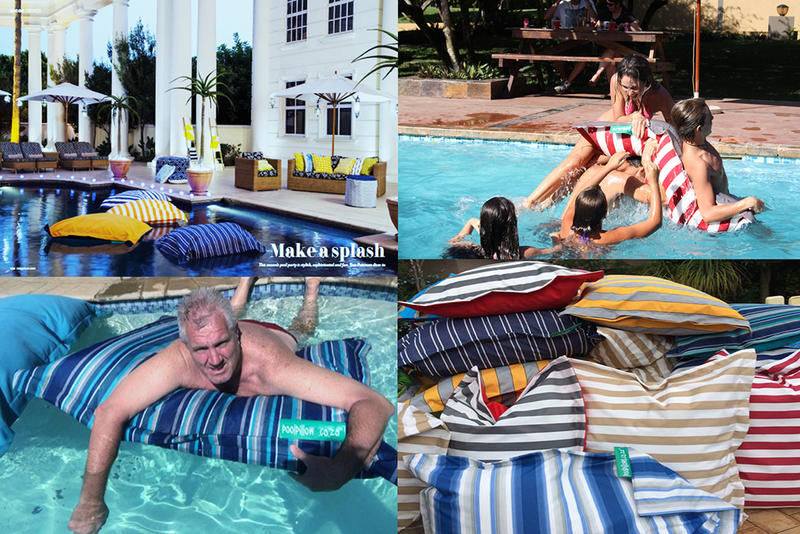 Get your Pool Pillow today, summer will never be the same again. 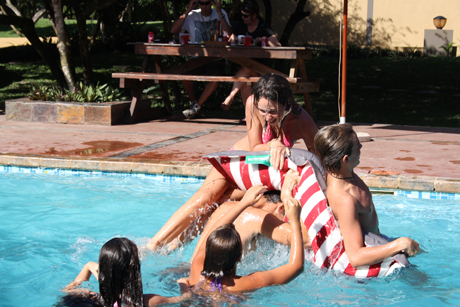 Pool Pillows (Official) 100% Original, we simply Rule the Pool! 1.5m x 1.1. The PoolPillow can be manipulated into any shape for your comfort, on its side like a chair, flat like a bed, you can even stand and float on it! Custom sizes can be ordered. 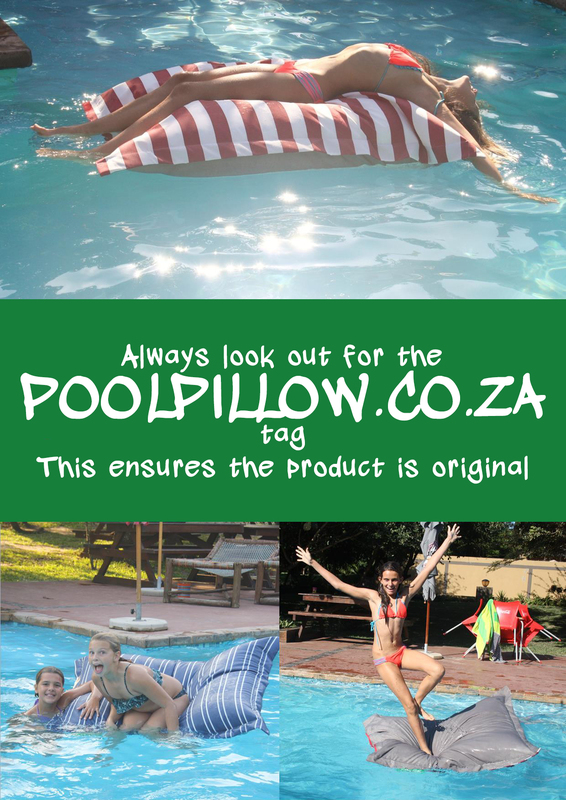 You would need to pop us a mail on info@poolpillow.co.za with the size and we will let you know if it is possible. The inner is filled with hundreds and thousands of waterproof polystyrene beads, allowing you to mould the pillow into any shape around your body for ultimate comfort. The inner is filled with waterproof polymer beads and is closed by means of a zip in the event of you wishing to add more filler, then the inner is inserted into the strong, UV and chlorine treated durable canvas cover of your choice. The fabric is very easy to clean. A little water and soap will have your PoolPillow looking like new. Alternatively, you can unzip the outer, pull it off and pop into the washing machine on a cool wash. Always remove your Pool Pillows from the pool before adding any chlorines or harsh pool cleaners. After use, remove your Pool Pillow from the pool, rinse with clean water and leave it on a table or chair that allows the excess water to drained out of it. Dry in an airy shaded area out of direct sunlight. To hand wash just add a little soap and water, to machine wash remove the outer cover by opening the zip and wash in a cold wash.
Do not tumble dry and do not bleach. “Fantastic service, found exactly what we were looking for! “I would rate PoolPillows 5 out of 5 and here's why: they have a professional outlook and listen to their customers needs, and don't offer what they believe is wrong for the customer. “The few instances where I needed help, you were right there to assist, in a timely manner, I might add. Well done, keep up the great work! We'll do everything we can to make sure you get your desired Pool Pillow.